This beautiful globe cactus native to Mexico is a great solution for arid situations in locations that don't get severe frosts. The distinctive round shape and golden yellow spines provide a unique, architectural structure in the landscape. 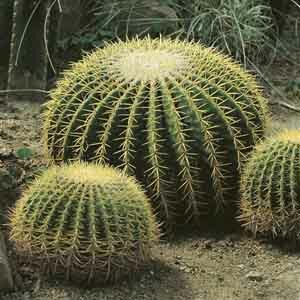 Barrel cactus is considered an endangered species in its original habitat, but cultivation has sustained the species and it is now grown world-wide. Produces yellow blooms but usually not until mature at around 20 years. Wonderful for containers and xeriscaping. Terrific accent plants that add interesting shape to the garden. Water every two weeks during dry weather. Drought tolerant and virtually carefree. During extremely dry periods water thoroughly once a week for best performance.